Trap flying insects with DynaTrap, flying insect traps, now at J&N Feed and Seed. 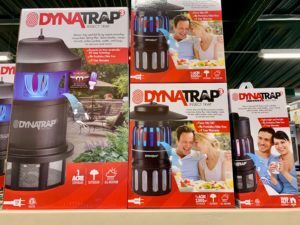 DynaTrap is the safe, silent, and simple way to safeguard your living space from mosquitoes and more by trapping insects without the use of chemicals. Our indoor & outdoor mosquito traps handle the toughest flying pests. Just plug DynaTrap into a standard outlet. The AtraktaGlo light lures in flies and other insects, and they are quickly and discreetly trapped by the replaceable StickyTech Gule Card. Safe for use in the kitchen, bath, office, garage and of course outdoors. We’ve got sizes that cover 1/4 acre all the way up to full acreage coverage. Stop by J&N Feed and Seed and see which size is right for you. This entry was posted on Friday, March 29th, 2019 at 1:57 pm	and is filed under News & Updates. You can follow any responses to this entry through the RSS 2.0 feed. Both comments and pings are currently closed.